The 10′ x 8′ Shed-Plus Champion Heavy Duty Reverse Apex Single Door Shed is a shed which is sure to impress anyone who gazes upon it. It has plenty of room to store things or be used as a workshop and it has a very classy and cool type of style that is sure to get a lot of compliments from friends and neighbours. There is a good sized door which has been given a little extra framing to make it extra strong. Two opening windows are included and will let a steady flow of fresh air into the shed. When you are in the shed, you will greatly benefit from the elevated eaves which give you extra headroom. You might also like to see the top 20 8×10 shed currently on sale in the UK by visiting the WhatShed 8×10 shed awards league table. The Champion series of sheds is all about offering an attractive design with top of the line materials. The materials are very impressive with all of the timber being pressure treated to make it long lasting. The frame is very strong and even has extra bracing to make the whole structure very robust. The walls are made with tongue and groove shiplap cladding and even the floor and roof are made with tongue and groove boards. In all this is a shed that is very well put together. Just look at that picture, how you can you not love the look of the amazing, 10′ x 8′ Shed-Plus Champion Heavy Duty Reverse Apex Single Door Shed? We have seen many sheds from the Shed-Plus Champion line and this one right here has a very cool look. 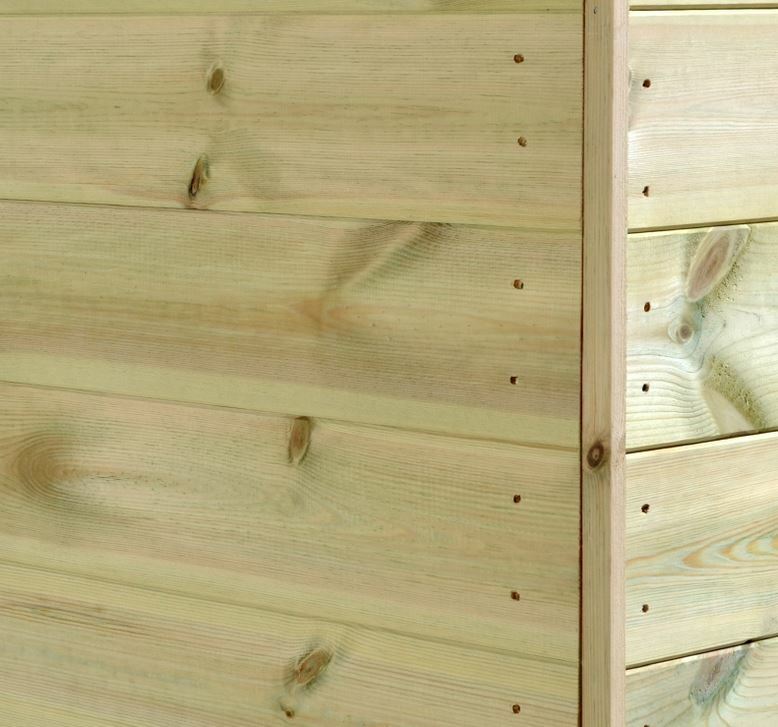 Part of what gives the shed its attractive look is the timber which has been pressure treated to make it strong. This is an impressive size and would work very well as a workshop or just as an area for some storage. 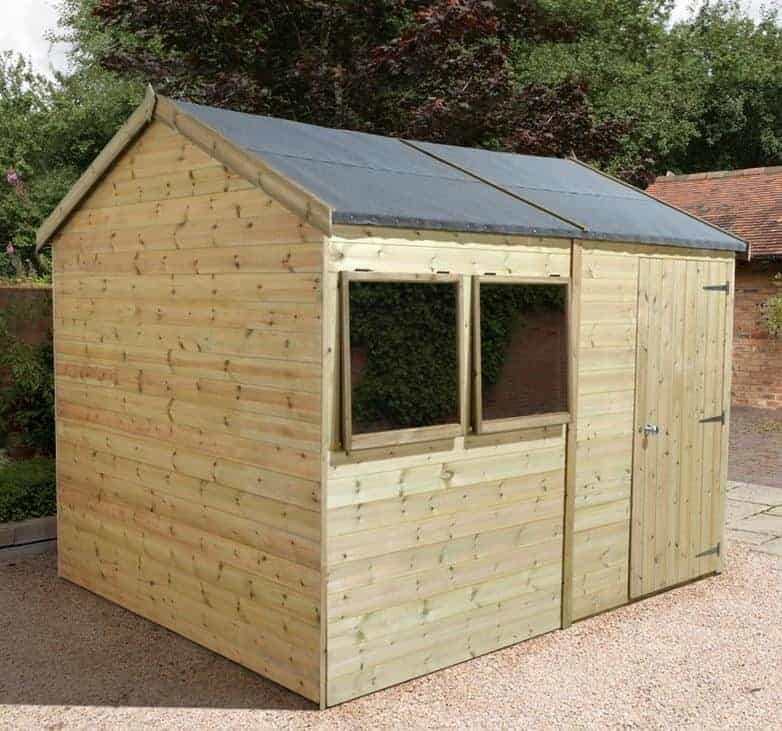 The width of the shed is 9 feet 11 inches and the depth 8 feet so you have a lot of floor space, but not at the expense of this shed being so large that it takes over your whole garden. 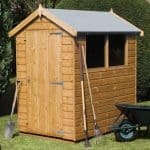 There are elevated eaves which give you more headroom than you would get with a regular shed. How much headroom do you get? Well the highest point of this shed is an incredible, 8 feet 4 inches. The apex roof that Shed-Plus use on their Champion sheds is very impressive. It is angled so that rain cannot sit on top, but it is also made with some very high quality materials. To start with the felt is no normal felt. It is 20 kg, heavy duty mineral felt that will last for many years. This felt is covering tongue and groove boards which are 12 mm thick and are going to ensure your belongings stay water and rust free. The cladding has been very well designed and is rigid and tight so that no water can sneak its way into the shed. 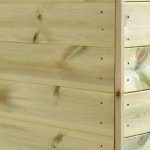 12 mm thick tongue and groove shiplap cladding is what Shed-Plus like to use on this line of sheds and we really like that they do. It is high quality and it also has a very smart look to it as well. One thing that makes this such a robust shed is the frame that is behind the cladding. No matter how many times we see this frame from Shed-Plus, we always are impressed. 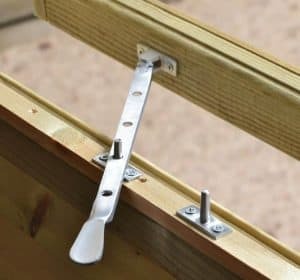 The frame is a solid size at, 34 mm x 35 mm and to make it stay strong for a few decades, the end panels on the frame have been given diagonal cross braces at the end panels. The Champion line of sheds has one of the most impressive floors of any series of sheds. 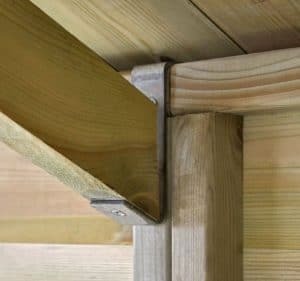 Made with 12 mm thick, tongue and groove boarding and supported with pressure treated floor joists to raise it and help prevent rot on the bottom of the shed. This floor is up to the task of taking a whole lot of weight so no matter if you want to store lots of heavy things or if you plan on throwing some kind of line dancing party, the floor is going to be able to handle the weight. The wood goes through a very thorough pressure treatment process that is going to make it last for a lot of years. But to prevent rot and to make that wood still look smooth and sleek for many years, you will need to coat it with wood treatment after construction and then also once a year. 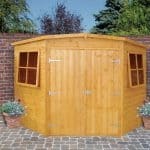 The 15 year guarantee that Shed-Plus give is one of the best of any shed manufacturer. The pressure treatment process is why they are able to give such a long and reliable guarantee. The door is 2 feet 11 inches wide and 5 feet 11 inches high. We are very impressed with this door as it not only is a decent size, but it is also designed very well also. To start with it is held in its place with heavy duty hinges that will prevent the door from sagging as time passes. Also the door has been given a little extra framing to make sure it stays strong for many years. Two windows are on the front of the shed and they look fantastic. These windows are made with toughened safety glass to prevent them from smashing when one of the kids hits them with the Frisbee. Also as well as being large so that they let in light, both windows can be opened so you can let some fresh air into the shed as well. Very few sheds can match the 10′ x 8′ Shed-Plus Champion Heavy Duty Reverse Apex Single Door Shed in terms of the security it provides. As you have probably realised, this is one very secure shed thanks to the materials used and its awesome design. 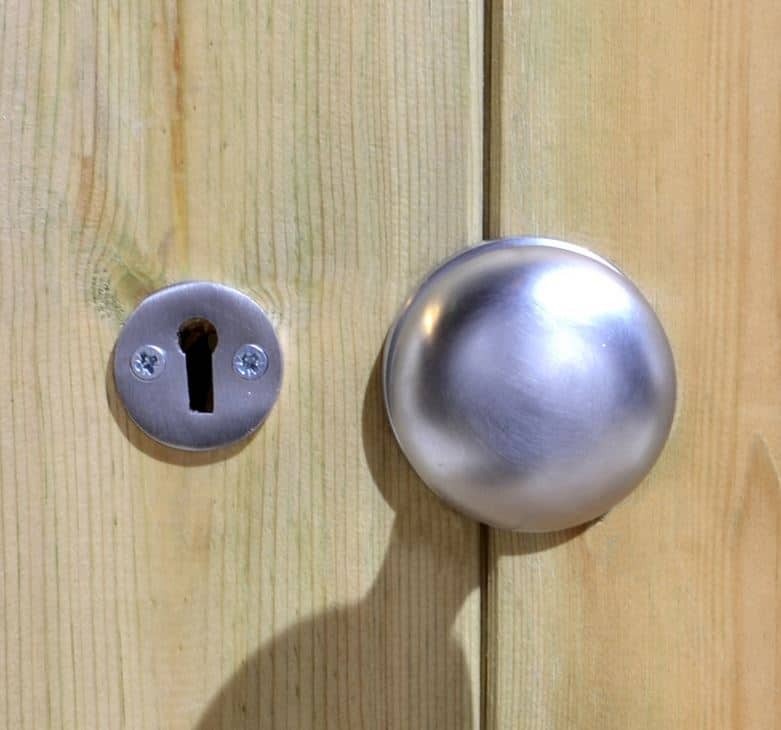 Greatly aiding the security is a lock that is on the door so you can keep things locked up safely while you are not at home and during the evenings. While the two windows are large they are only on one side of the shed so this is actually a pretty private shed. If you position it so the windows are not facing the street or a wide open area then you will not have to worry about nosey people trying to see what you have inside. To be honest with you the design of this shed is pretty much perfect and that is great as there is not really much you can do to change the look of the shed. You could always add something like a hanging basket. We love the way the timber looks, but if you want to shake things up a little then try a coloured wood treatment. There are a few different extras that this shed has for you to consider. 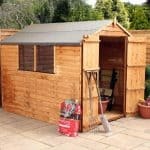 They do actually offer an installation service where they will build the shed for you, but this will cost you, £149.00. A workbench is available at a cost of, £74.99. What is great about this workbench is that it has been made to look just like the shed so it goes with it very well. Last of all we have an epic slatted roof. This roof looks amazing, but it does cost £309.99, which is far from cheap. This is a very high quality shed and honestly we would not have expected anything less from the Shed-Plus, Champion series. The pressure treatment process that they put the timber through ensures the wood is going to last for a long time. With a little help from you, you will be able to enjoy this shed for well over 20 years. While not the largest shed in the word, 10 x 8 is a very good size that works well for storage and as a place to work or even relax. This is a job for two people and if you follow the instructions and do not argue over whose turn it is to make the coffee then you will have it built in 3-5 hours. 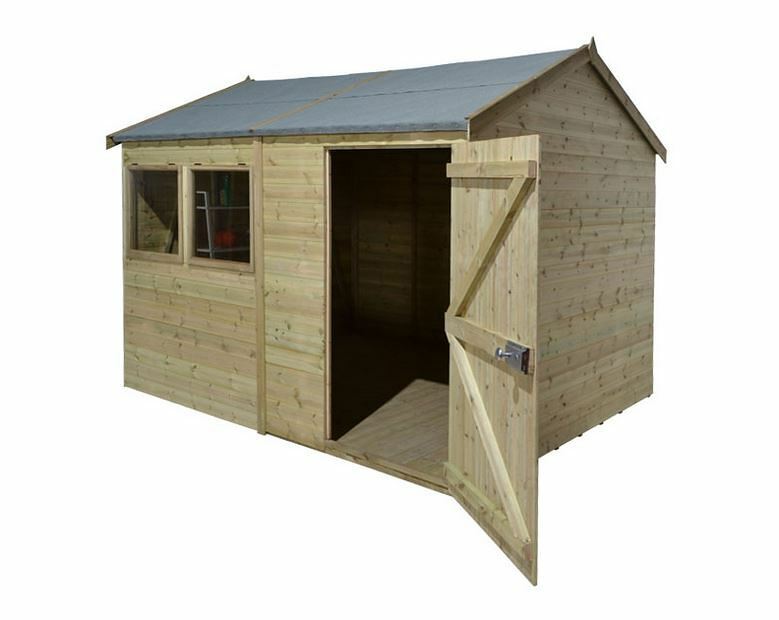 This is a shed that is just under a thousand pounds so it is far from cheap. But you are getting an incredible shed for you money that is going to last a long time. Final Thoughts: The 10' x 8' Shed-Plus Champion Heavy Duty Reverse Apex Single Door Shed may be on the pricy side, but we feel this is a case of you getting what you pay for. 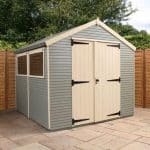 This is not overpriced, considering the materials used and just how nice it looks, we actually feel this shed is priced very well and would look incredible in your garden as well as providing you with extra storage space. 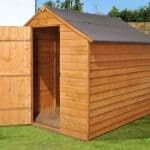 So while it may be tempting to purchase a similar sized, but far cheaper shed. 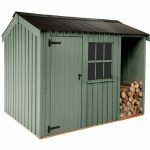 We suggest you strongly consider saving up a little longer and buying something with more quality like this shed.